Bathe in the sun-like warmth and enjoy the pleasant hours on the cooler evenings with this high efficient infrared heater which produces 2000 watts of radiant heat energy. 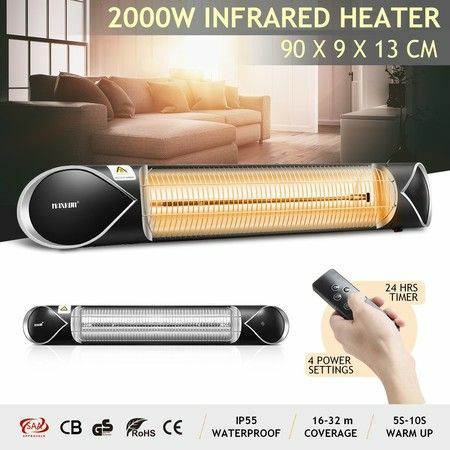 Featuring carbon fibre bulb technology, this electric heater is able to deliver heat in 5 to 10 seconds and warms objects and people directly. Constructed from quality and durable alumina housing with stainless steel mesh, this patio heater contributes to reflect 98% of energy to living area without heat loss. For your peace of mind, this radiant heater is safe, secure, healthy and eco-friendly without burning oxygen and reducing moisture in the air. Equipped with a remote control, this outdoor heater allows to adjust the heat to your desired level. Mount the electric infrared heater on the wall or ceiling to entertain yourself or guests in the chilly months. 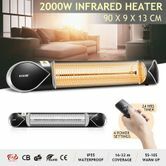 The high-performance carbon-fibre technology heating tube of MAXKON Infrared Heater produces a large amount of heat quickly at a power of 2000W, and could minimize oxygen consumption and moisture loss in the air.